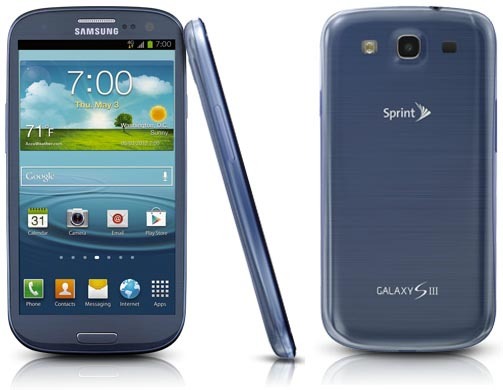 Samsung and Sprint are planning to re-release the Galaxy S III in a Sprint tri-band LTE edition. According to the Sprint UA profile, the SPH-L710T has mostly the same specs as the original GS3, except the inclusion of tri-band LTE, and an upgrade to Android 4.4.2. Plus, in a nice twist, Samsung didn't make confidential the antenna diagram for this phone, so I include it for your viewing pleasure. Remember, as with all other Sprint tri-band LTE handsets, this phone is not capable of supporting SVLTE because the single transmit path is shared among CDMA1X, EV-DO, and LTE. But the phone is open to be another Sprint Wi-Fi calling capable device based on the fact that Samsung made sure to include this phrase in the simultaneous transmission scenarios section: "Pre-installed VOIP applications are considered." Also included is 802.11a/b/g/n Wi-Fi with support for 40MHz 802.11n carriers. Unfortunately, in hotspot mode, all 5 GHz Wi-Fi is disabled. Next entry LG G2 mini: A Day Late and a Dollar Short? Yes, I'm serious. However, this may be for Virgin and Boost, and could be replacing the Single Band GS3, just like the S4T did the S4. Sprint could move their entire device lineup to Tri-band LTE this year, and dump all the single band smartphones in favor of cheap entry level phones like the twin Kyocera's I posted here. This is very interesting. Would be good for a cheap tri-band phone for anyone who can't afford the latest and greatest. Would be a good incentive for people to upgrade their old phone for something that isn't as expensive. Possibly the same price as the GS3 or maybe $50 cheaper. That's one thing I was thinking about. It could even be used to get the rest of the Sprint WiMax phone users over to LTE like they've been talking about for the last 6 months or so. That would be a good way to do it. I told my mom about it and if it is the same price as the GS3 or even cheaper, that is a heck of a deal, especially for a tri-band device. At the moment, there is zero reason for me to upgrade to a tri-band LTE phone. I'd loose LTE (B25) service right now due to eCSFB issues, and there is no B41 or B26 nearby for me to take advantage of. Oh, and I loose SVLTE, which is a very nice thing to have while laying down some purple! How about the Note 3...? We have no idea at this time. This was a surprise to even me when I found it on Friday. If the Note 3 does get a tri-band upgrade, I will let you know. True, it's better to get the latest and greatest, but this phone is being specifically catered to beginning buyers and very possibly the WiMax replacement program. I really feel that's the primary reason for re-certification. It was more of a question directed to Sprint/Samsung. Surely the sales of the Note 3 and GS3 are similar enough at this point to warrant a triband Note 3. I don't think it's that simple of a decision. The S3 is so far behind the S5 that is makes sense to open that up to the "economy smartphone" market. The Note 3 versus the Note 4 might be more of an incremental upgrade. You don't want to take sales away from your flagship phablet. Could it happen much later to open the "economy phablet" market? I would think that is much more likely. Nice find Josh. This would be a nice economic switch for wimax users. Though it may be intended for Boost or Virgin in a prepay format, it would be a nice addition with the Framily plan in the Sprint Corporate lineup. This could be a big win for Sprint. Did you happen to see a possible release date? Josh, let us be clear. This is not "recertification." That would be a Class II Permissive Change filing for the original Galaxy S III. This is a completely different handset. You are right, I was using the wrong word there. I should have said a minor re-design since it got a RAM upgrade to 2GB in the process of gaining tri-band LTE. I wish the FCC or the UA profile had release dates available. I'm guessing May or June, but it could be later in the summer. However, if Sprint is trying to eliminate single band devices quickly, I look for it in May or June. Wow... That's... impressive. Samsung is actually supporting a 2 year old device, whether it's meant for VM/BST or not. As a previous GS3 owner, I can say that the GS3 was an awesome device aside from the lagginess introduced by Touchwiz. I may have actually kept mine to this day if it was triband capable. I assume since this model has 4.4.2, it should have the updated Touchwiz. Josh, the Sprint Galaxy S3 (SPH-L710) already comes loaded with 2GB of RAM. Only thing that looks to be different besides the tri-band goodies is that the SPH-L710T will be coming pre-loaded with Android 4.4.2, even though there is a 4.4.2 update coming down the pipeline in May for the single-band LTE S3 (SPH-L710). Josh, the Sprint Galaxy S3 (SPH-L710) already comes loaded with 2GB of RAM. Only thing that looks to be different besides the tri-band goodies is that the SPH-L710T will be coming pre-loaded with Android 4.4.2, even though there is a 4.4.2 update coming down the pipeline in May for the single-band LTE S3 (SPH-L-710). You are right, I'll fix that in a moment. It did come with 2GB RAM. I only thought it was 1GB. Since the original S3 for Boost and Virgin had a price of $399 but I had thought that they put a slightly slower clocked processor (1.2Ghz dual core, compared to1.5Ghz dual core) and I am not sure if it had the same amount of ram. I just remember seeing the specs listed at a best buy, no idea why they did this, but sprint is a business and they need to make money. I would imagine that it will be cheaper on prepaid since it is now 2 phone cycles old, but time will tell. The S3 was and still is a good phone, though no longer the subject of envy from bystanders... it was ahead of the times with 2Gb ram and the performance is still good with a dual core processor. In fact, I believe that to the casual user, they would not notice too much difference between their experience on this device and a newer device. Android has hit a plateau (in a good way) where the software runs smoothly on a range of equipment, and it is mainly us spec-nuts that are power users who NEED the new tech. I think that Samsung is trying to follow the Apple business model by having the older phones stick around as cheaper alternatives to the new flagships. I think that you are dead on with sprint wanting a cheap option that will give the benefits of their new network, because if someone wants to join sprint, and then finds out "well that phone will not have as good of coverage or speed". Corporate accounts might have this as the base phone option, it would be pretty cheap with easy pay on a Framily, and there are many MVNO's who would like a good option at a fair price. I will say that Samsung is the only company that seems to be refreshing their phones for sprint and their new network, I wonder if any of the other manufacturers will follow suit? I'm going to say no for now, but I sure hope that HTC considers it because it seems to open a good range for customers who want to jump into a smartphone, but don't want to buy the latest flagship.